I’ve been a fan of old buildings for pretty much my whole life, having grown up working for my family’s historic building renovation company. I took my childhood experience of working with 19th-and-early-20th-century buildings off to graduate school and got a master’s degree at the Eastern Michigan University Historic Preservation program in the early 1990s. While eventually landing working in digital media in NYC, I spent a ton of time along the way with various internships with venerable organizations like the National Trust For Historic Preservation and the New York Landmarks Conservancy. Even though my professional pursuits have moved away from old buildings, they remain a keen interest of mine. I’ve collected a fair number of books about the history of New York’s urban environment and some nice postcards of the old city, including a nifty folding panoramic vintage postcard of the old Gotham skyline view from my adopted borough of Brooklyn (above). My everyday life in New York City surrounds my in a wondrous timeline of architectural and engineering marvels. And so as a gamer, New York 1901 allows me to live through the early days of this history right from the comfort of my tabletop. 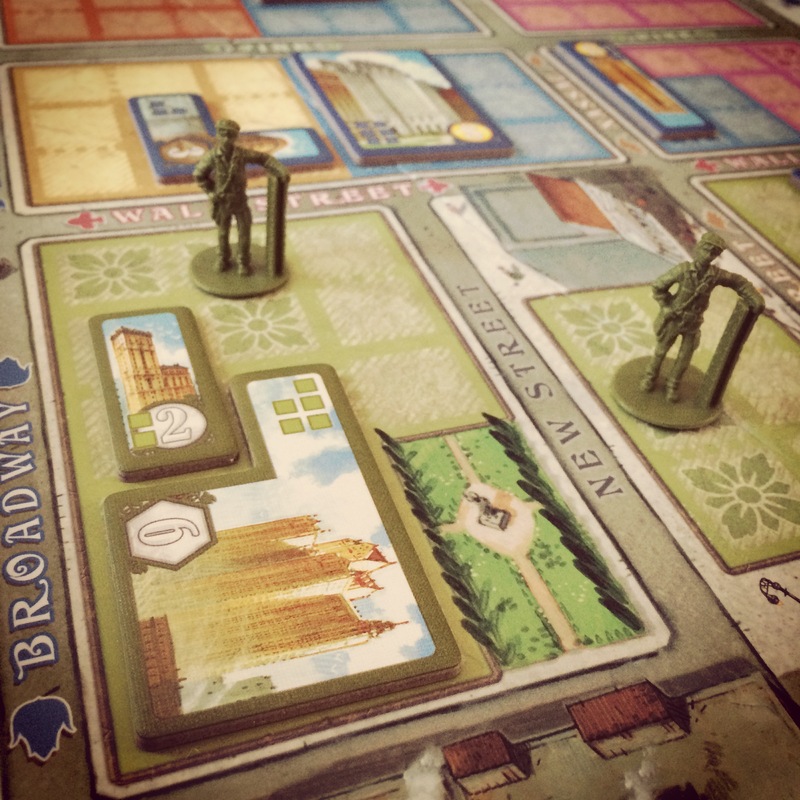 A big hit at GenCon 2015, New York 1901 by Blue Orange Games places up to four players in the roles of early real estate developers at the southern tip of Manhattan at the dawn of the 20th-century. 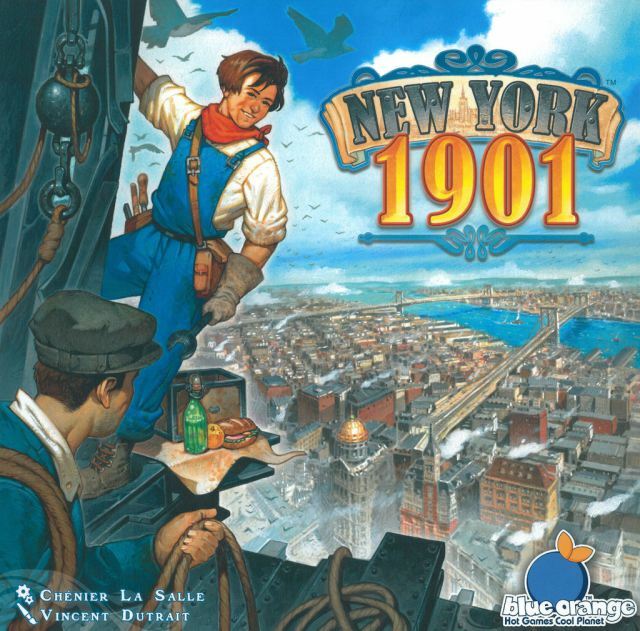 New York 1901 is the first foray into Euro-style strategy games from Blue Orange which is best known for family, educational and party games. The game hits the right notes of strategy, ease of play and short game time creating a great balance for players of all ages who may already be steeped in modern classics like Settlers of Catan and Ticket To Ride. 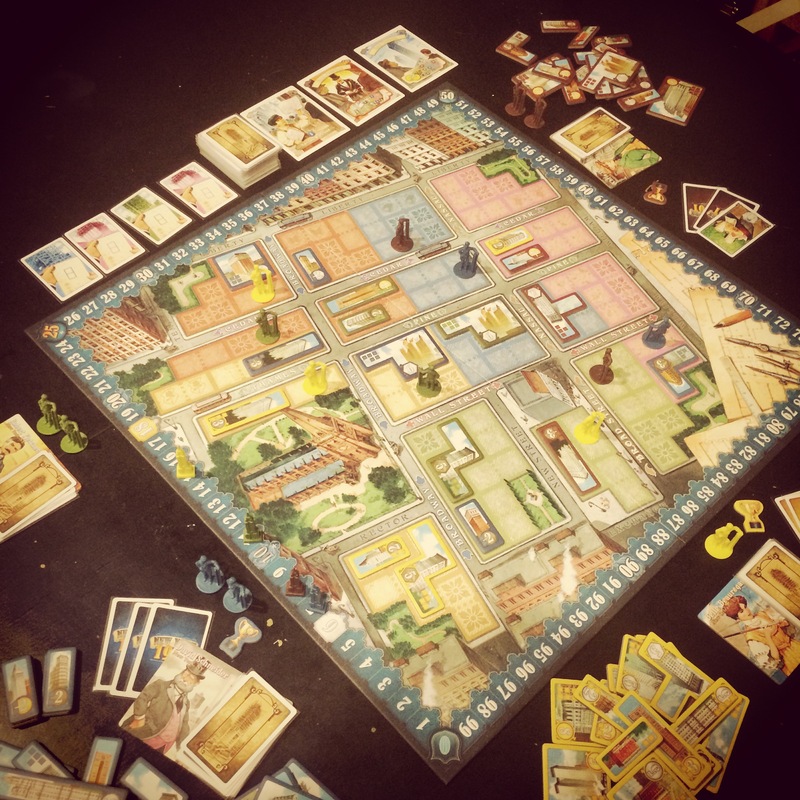 In the game, each player takes turns as burgeoning real estate developer (including a couple female roles) acquiring building lots, placing workers and erecting buildings. The lots occupy the lower Manhattan grid laced with famed streets bordering colored lots. At the beginning of the game, a ‘marketplace’ of four lot cards is set next to the board. In turn, players have two options. First, they may select a new lot and place worker to claim the lot on the board. Alternatively, a player may remove a worker or workers on contiguous lots to build a new building or demolish an existing building and construct a new one. Buildings come in a variety of shapes and sizes, including straight, square, rectangular, ell-shaped or other more complex shapes. The structures also represent three separate progressions of age — bronze, silver and gold. The combination of color and building shape gives each building a point value which is scored on the track at the edge of the board. Only once certain levels of points are achieved may a player begin to play the next color category of buildings. Like real estate development in actual New York, constructing a new building may involve demolishing earlier buildings to replace them with new, larger and higher-valued structures. Multiple buildings on adjacent lots may also be torn down to allow for even larger buildings to be built. 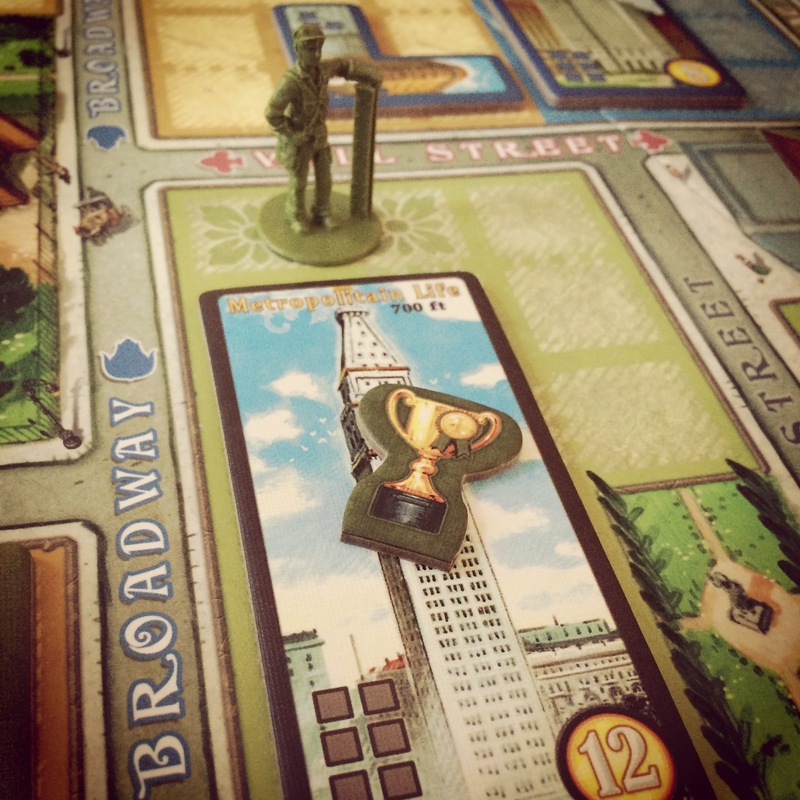 Once the gold level of buildings is reached, players may also select from four unique high-scoring ‘legendary skyscraper’ tiles, including the Metropolitan Life, Park Row, Singer and Woolworth buildings, and then mark the building with their own trophy piece marking the achievement as a master builder. Special action cards allow players to perform one-off acts like acquiring two lots at once or constructing two buildings in the same turn. 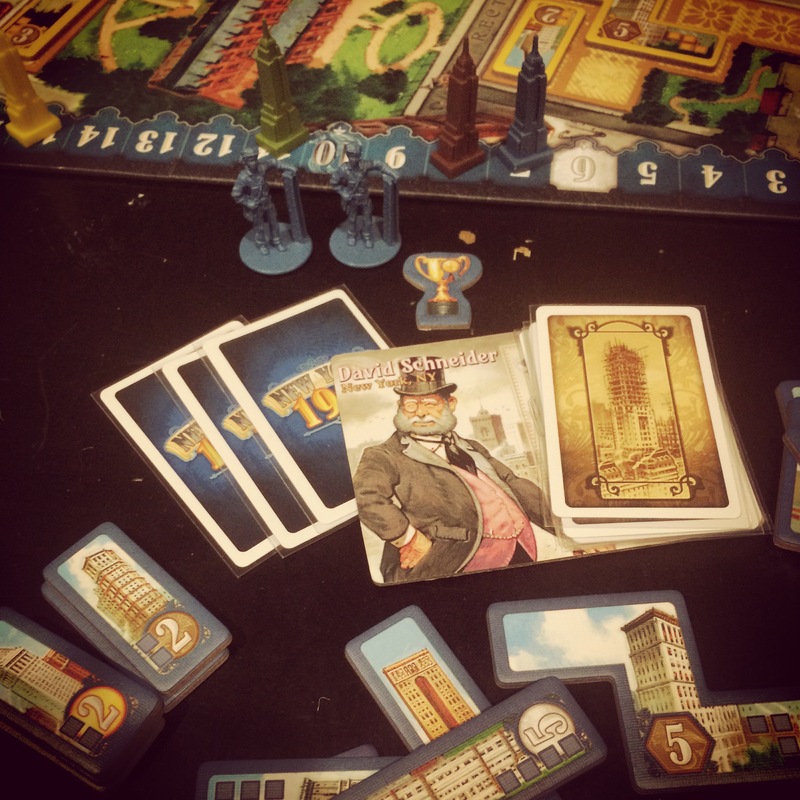 The game ends when a player first depletes their building tile stock, and final bonus scoring is made according to random cards defining building dominance along prominent streets or other combinations of construction feats. Fitting the buildings onto lots gives New York 1901 a spatial puzzle-like quality many have compared to Tetris. To me, the action of occupying lots and erecting buildings to block other players from doing the same gives the game a feel more akin to Cathedral. The combination of worker placement, area control and card play combine to touch on multiple major game mechanics, again making this a great intro game for newcomers and a quick, satisfying play for more experienced players. 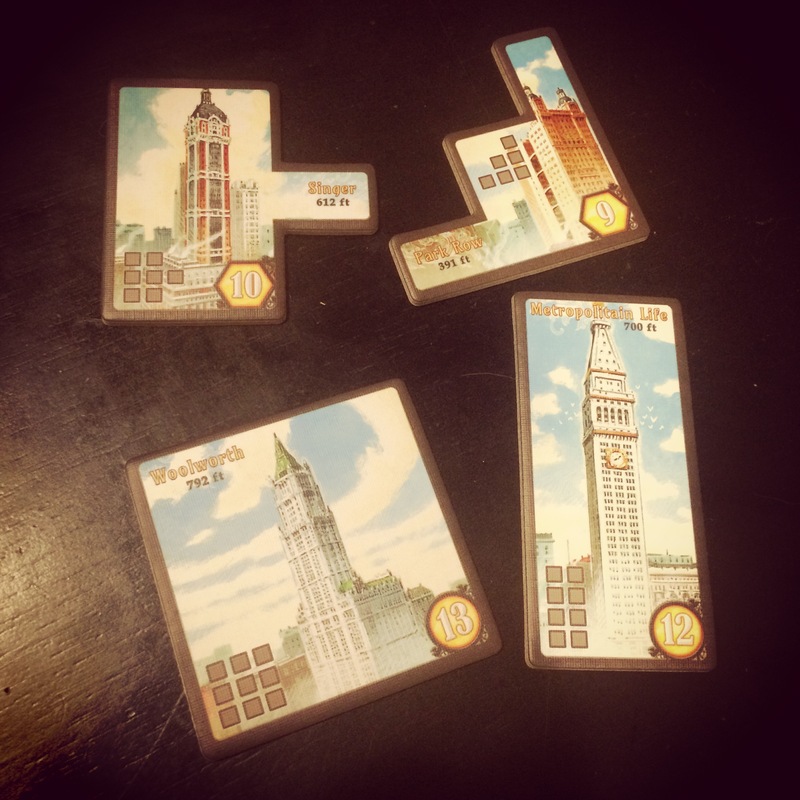 While the game rests many popular mechanics, New York 1901 departs from many games in the Euro genre with a dazzling design of building tiles depicting graphics looking very much like the vintage postcards I collect. Steeped in history and the grid of New York’s Financial District, the game also serves as a creative potential jumping off point for families and school groups to learn more about the city’s history or tour some of the sites away from the game board of New York 1901.